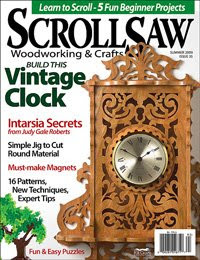 This magazine is all about Scroll Saw projects and woodworking. They heard about the props I've made with the help of the scroll saw, and did a little half page article about me. If you see the magazine on the newsstands, check it out, I'm on the last page. Check the downloads section on the right hand side of this page for the scroll saw patterns I use for my props.